I attend my friend & photographer of Coconut Lace Farah Zobe. I was a beautiful traditional wedding binding the love of two beautiful souls. I have to admit it took a few changes before i decided on this outfit. Sanuk is and American brand (started in Southern California) that was founded by Jeff Kelley. He combined the zen and calm lifestyle and applied it in design & fit. The name Sanuk (originally from the Thai language) means Happiness & Funk, which is evident throughout out the collection. Established in 1997, Sanuk has grown from the initial design of using inner tubes & indoor-outdoor carpet to making the first sandals. It has since expanded into boots, loafers, high top light booties & the classic Yoga Mat sandals for both men and women. I found my self drawn to Saunk for the obvious reasons of comfort & style, but also for the organic feel of the brand. I have few styles in mind that stands out and I cannot wait to have my hands on them. Of course being a fan of comfort & sneakers I will be adding them to my wardrobe very soon. lets face it, Who can resist a cute pair of shoes? and to top it off are super comfortable. Having already established a significant following of clients around the Globe, Canadians can now shop the Sanuk collection online. Fall 2014 makeup trend is all about a strong liner. Think winged, small or big and in any colour using liner, gel or liquid. Gel is my product of choice and using an angled brush provides ultimate control to allow for thin or very strong lines. The look is achieved in Fall colours that are purples, teals, navy blues(very hot for fall) and of course black. What are your thoughts on coloured liner and will you be trying it? Fall & Winter are just around the corner which can only mean hair damage. I have decided to create a check list to help with the upcoming seasons & how to be one step ahead. 1) Get a trim: No one is asking for inches off but a trim on the ends is a great way to start the season. 2) Condition and condition: I used to remember clients who would tell me they didn’t condition their hair and question why its brittle. Conditioning helps to put moisture and softness into the hair so remember this trip to always apply it on the ends first then work what is left to the roots. 3) Comb hair in the shower: I use a wide tooth comb and after I apply my conditioner I make sure to comb my hair. 4) Treatment: I know people who swear by hair masks so if it works for your hair type great! For me olive oil or coconut oil on the ends of the hair then tied in a bun for a few hours before a shower is a great way to give your hair a treatment. Just remember don’t get any on the roots & only do this once or twice a month. 5) Hair Break: We get tired of the same food imagine how our hair feels from the same style! So give your hair a break on weekends and try to make the blow-dry a part time friend. For as long as I remember, I have been on the hunt for the perfect denim shirt. The requirements were: slim fit, long enough to tuck into jeans or trousers, and to finish it off a perfect washout look. 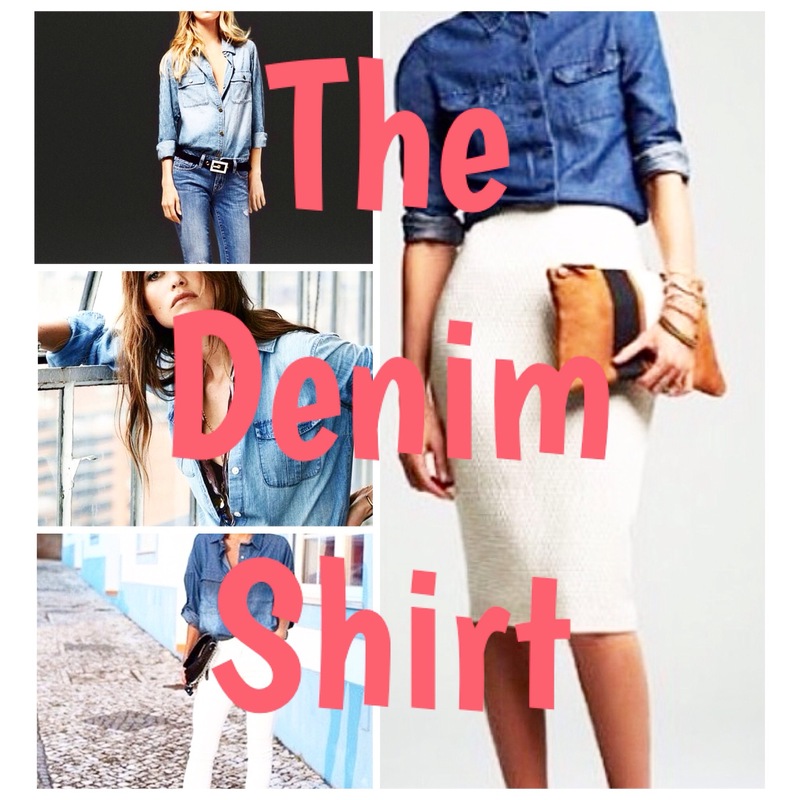 I wanted one that can be work as a classic Canadian tux, yet chic enough to pair with a blouse. I am still on the hunt and although I have seen my share of denim shirts, they all fall short. So here are my fav looks. Help to direct me or suggest a brand that you love.. Let me know! !